Topic: Wardrobe Planning. YES, I plan my wardrobe! I never thought to write about it. This question of wardrobe planning came up in the blog world and I am only too happy to answer. In short, I believe wardrobe planning, like everything, takes a certain amount of self-control and focus. 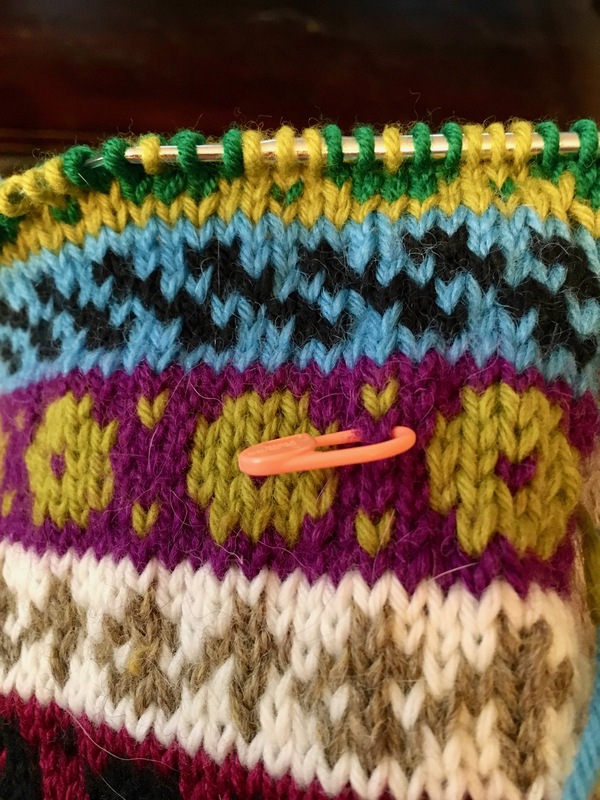 The process for me begins with retiring belongings, otherwise known as cleaning out or donating, for the obvious purpose of organizing but in a knitter’s case, this careful consideration informs [knitting] project choice. Ravelry acts as a record-keeping system. What does this mean? I like to sort and organize. It is who I am. It helps me to think things out and give reason to what I have. I purge belongings often and have developed a two-step system, housing the discarded in the basement for a year or so before permanent departure [to charity or elsewhere]. This makes sure of my decision. I know immediately when I need to clean out because when I walk into space that is cluttered and in disarray, I’ve noticed my brain goes into automatic shut down. This was true during the employment years as well, both in the classroom and at home. The calendar suggests a natural time to organize especially as a teacher. July/August, are times classrooms get ready for the following year so became perfect for purging what hadn’t been used. At home, it was natural to clean out children’s bedrooms of old knick-knacks and my closet of clothing knowing the upcoming year would replenish. I may consider this schedule for an annual cleaning out since it is already a part of my being. So, when I retired last year, I wondered about anything and everything that belonged specifically to me. Questions like, do I need this? Do I want this? In a household of a marriage, there are those things such as wardrobe and personal belongings, yarn for example where I feel single ownership, as opposed to those things I feel are jointly owned. I was secretly hoping that hubby might pick up on my behavior and do the same with his things. From make-up to sewing machines, I gave my ‘stuff’ attention for the purpose of deciding whether to retire that item or not. It is amazing how confronting your possessions is gratifying and helps to formulate direction for your future. I began with an area I care least about. Make-up and make-up routines. Reading an article on beauty in women of my current age, it suggested the less make-up, the better. Never so happy, it was easy to downsize these belongings. Aside from lotions for moisturizing skin, the pile of un-necessaries was large, emotionally uplifting to rid myself of them, and discarded. This photo pretty much shows all that is left. My wardrobe can easily be sorted into three categories: “farm”, sportswear, and career. No, I do not live on a farm but nickname my around-the-house clothes farm clothes because owning a lab is like owning a horse with the constant care and attention that is given and cleaning the house suggests scrubs of sorts, not any item of clothing I should wear out of the house. This wardrobe is minimal, truthfully embarrassing to wear, slouchy and admittedly very comfortable. My sportswear is minimal because clothing in this category is expensive and it was never a wish to be fashionable while running [yet that want in me is growing]. I have only a few pieces that have been worn for years and actually now that I am much more public with my OrangeTheory membership, I do need to build up this wardrobe. Simply put, my career wardrobe was large at the time of retirement and the only category involving knitting as these are the clothes I pair with my hand knits. I knew right away I would take these items of clothing and reconsider what I still needed. My life was changing, obviously my clothing needs would change. Now, about a little over a year later, I would say I have successfully downsized to about 50% of what I had. When choosing what to keep, knowing needs and intentions, you can make wise choices picking basic shapes and color of key pieces such as pants, tees, and blouses, those clothes that can easily pair with hand knits. So, for me I love to wear a variety of silhouettes. My hand knit collection is filled with different shaped garments and typically involve color, lots of color. The knitted piece is typically the highlight of my fashion statements so I needed to keep solids as coordinating pieces. I needed to keep a catch of dark, solid bottoms and easy tees that could mix and match. I do love a crisp white blouse so made sure to hang on to a few. This category is the only part of my wardrobe I think about when thinking of the next knitting project. I continue to call it ‘career’ as I cannot think of why not as I do continue to maintain a purpose in society and is that not what a career is all about? Dividing my wardrobe into categories enabled me to think more critically on that activity and its clothing to make clear, concise choices for wardrobe planning. As I get older, I am noticing I am not as interested in possessions as I once was. I might even say I’ve put a new spin on “less is more”. I was in a store recently and overheard one say to another, “No, I cannot buy that, it is not in my color palate.” The shopper had intention. I liked that. When I shop for a garment, I only shop for that item I told myself I needed staying focused and not coming home with a purchase on a whim. Let’s face it. The stores are filled with beautiful, tempting clothing items. How often have you come home with that purchase that you ‘had to have’ only to realize you have nothing to wear with it. There is interaction and mix and matching that goes on with a smartly chosen wardrobe. 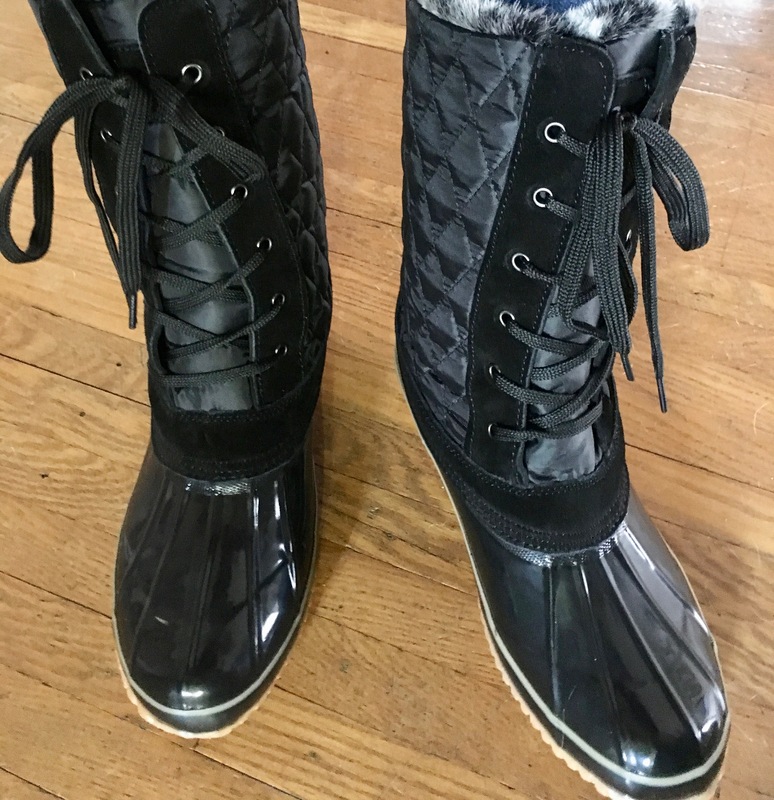 Recently, I was shopping for a dressy snow boot. Below is my victory that will work perfectly for trooping in the snow with a stylish winter statement. Personal toys have gone through a similar process. It is heavenly seeing sunlight on shelves. As a knitter and having a manageable sized wardrobe with clear intent of each piece, allows me to see how my current collection of hand knits can be fashioned. Having an intentional wardrobe allows clear direction in choosing projects for the future. Utilizing my project page on Ravelry as a sort of record-keeping system helps me remember how I paired these garments in the past! Stay tuned for fair isle coat, an alternative to a grey hoodie that will shortly become a part of my ‘career wardrobe’. Oh, and by the way, hubby did take notice and I’ve recently seen him adding to the bin of give-aways. I wrote about decluttering this week as well! 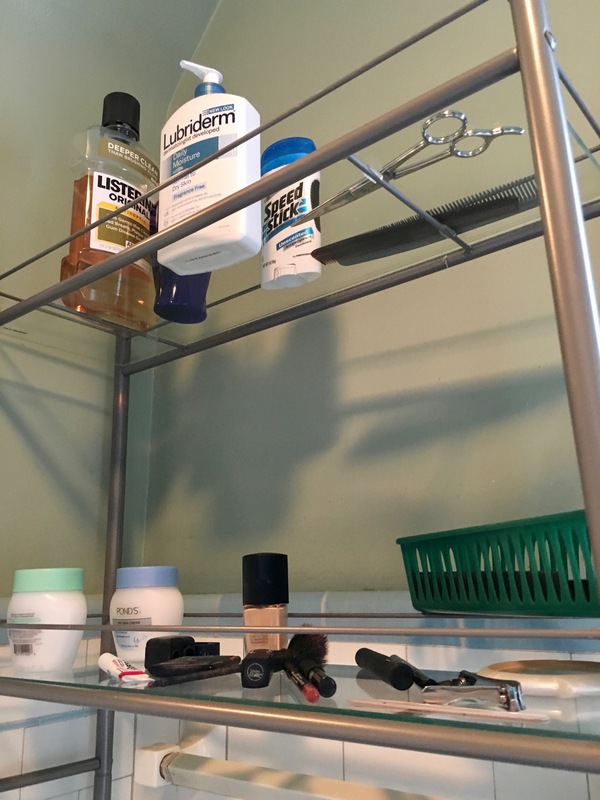 You’ve inspired me to add personal care closet shelves to the list. And hope that hubby will follow and be inspired. He now has more clothes and shoes than me! Well, now Pat . . . if you read the post carefully, you will see I did not talk about shoes and boots. That, admittedly is the one area I am having difficulty dispersing. But, I am knowing I need to face this category, as well or trip over the consequences! I love the cleaning and purging, too, but never seem to have enough time to do it! Wardrobe planning definitely happens, and I use solid bases 90 percent of the time, whether for casual or career. My handknits run to sweaters or shawls layered on top (sometimes both!) of plain solid shirts over plain solid skirts or slacks. So when I think about handknits, I think “what color cardigan would I prefer with this outfit?’ and if I wish for it enough, I eventually make it. :-) the handknits are the pop of color and texture in my wardrobe, especially career. And I stopped wearing makeup completely when I moved to Maine 20 years ago – you are right, it is so freeing! Now, to purge the craft room… I will never finish that job. All of this purchasing, purging, being creative yet not hoardish . . . . all of it takes such self control and focus. And, you are right, does take time. It is quite necessary for me to find the time as I have noticed it directly affects my happiness. I like the way you worded it . . . “hand knits being the pop of color and texture.” I would say that would be me, too!